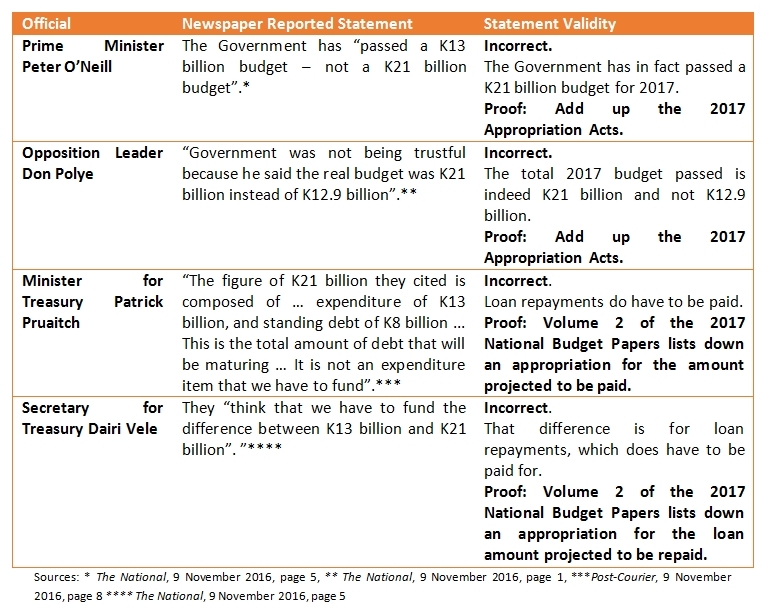 In tabular form below is a summary of statements made by Government, Opposition and bureaucratic officials about the 2017 National Budget and the veracity of those statements. Most troublesome and regrettable is that all these reported statements are incorrect in varying degrees. Our Constitution and other legislation sets out the legal requirements for public funds raising and spending. There are also legislation and accounting standards that govern how public funds are compiled and accounted for – the Government has just adopted a new fiscal accounting standard. Both are distinct concepts but the latter can be easily accommodated with our country’s legal requirements. The new international fiscal accounting standard is explained in Volume 1 of the 2016 and 2017 National Budget Papers. The purpose of the new standard is to compile statistics that correspond to other economic accounts and allows for economic analysis. It broadens the coverage of fiscal accounts beyond the national government to include subnational government, public enterprises and other public bodies. It also forces the gradual transition to accrual based accounting from the current cash basis used by Government. Accrual recording takes place when ownership transfer takes place or when services are provided rather than when cash payment takes place. Apart from complying with the international fiscal accounting standard, the Government most importantly still needs to comply with its own financial accounting frameworks and legal requirements, which it hasn’t done with the 2016 National Budget with respect to debt repayments. I also note that my analysis on the omission of the 2016 debt repayment appropriation has been misinterpreted and applied incorrectly to the receipts side of the national budget but some of the thinking underpinning that misapplication has merit and is worth exploring. In my posting on the omission of appropriation for debt repayments I was careful to distinguish between expenditure and payments. Payments is an all-encompassing term that includes expenses such as wage bill, goods and services, consumption of fixed capital, interest, subsidies, grants, and outlays relating to the acquisition of financial and non-financial assets as well as the settlement of loan principal repayments. each spending agency then makes commitments and raises cheques within the spending envelope set by the warrant authority with the agency authorization coming from accountable officers delegated to this task under sections 32 and 33 of the Public Finances (Management) Act 1994 by the spending agency (but the agency head remains ultimately accountable). When discussing the size of the budget it is usually the level of expenditure that is quoted so to allow clarity it is best called the expenditure budget. There is also a revenue budget. But ultimately total payments should match total receipts – these details can be found in the Volume 2 set of budget documents to verify this. I won’t dwell on the receipts side of the budget now. In exhibit B I show the inconsistencies the Government has in the 2016 National Budget. The figures are drawn from the 2016 Appropriation Bills and from the detailed tables in Volume 2 of the 2017 National Budget Papers. I note that the latter source has not been updated to reflect the changes in the 2016 Supplementary Budget. To highlight the error of the 2016 National Budget I also show a comparison between the 2017 Appropriation Bills and the detailed tables in Volume 2 of the 2017 National Budget Papers. There is a modest difference for the 2017 budget totals but this represents rounding off errors. The large and still as yet officially unacknowledged blunder is the difference of K10.5 billion in the 2016 National Budget. This is summarized in Exhibit C.
So in short the detailed numbers for the 2017 National Budget is matched by the Appropriation Bills, (now correctly called Appropriation Acts after being passed by Parliament). This is not the case for the 2016 National Budget, where the detailed tables’ numbers exceeds the Appropriation Acts by at least the K9.9 billion for loan repayments. This has still not been addressed and various laws including most importantly our Constitution has been breached. ← Is there a breach of the 30% debt-to-GDP limit set by law? These breaches in the Budget must be highlighted to the public who don’t seem to be aware of this. Most importantly, what is going to be done about this breach? 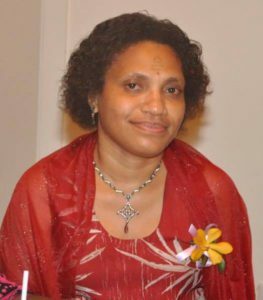 Is it serious enough to get the current Parliament to be dissolved by the GG? Or like everything else that has happened, are we just going to brush it aside and let it go? I’m totally disillusioned and disgusted by it all. Yes, I hope the newspapers make this known to the public. It’s been three weeks now since the breach has been highlighted. I have not seen or heard anything being done about it yet. If it’s pushed under the carpet, God help us! It is indeed disgusting.